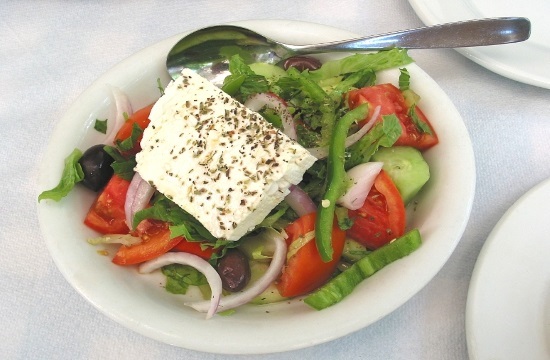 A recent study, Feta cheese proteins: Manifesting the identity of Greece׳s National Treasure by Dr. Athanasios Anagnostopoulos and Dr. George Tsangaris, reported the first complete protein content of feta cheese, isolating 489 proteins. The findings will allow for the development of a way to identify the original Greek cheese and preserve the protected designation of origin product. The study was funded by the Biomedical Research Foundation of the Academy of Athens (BRFAA), Greece. Dr. Tsangaris and Dr. Anagnostopoulos, the BRFAA researchers, analyzed with high-resolution mass spectrometers a large number of representative samples from parts of Greece producing PDO feta, identifying all the proteins and peptides they contain. PDO feta from all parts of Greece contain a total of 489 different proteins, making it one of the world’s most protein-rich cheeses. These 489 proteins are the “identity” of Greek feta and belong to various groups of bioactive proteins. Among the proteins are those associated with immune system regulation, with antimicrobial activity, as well as proteins that regulate the microbiome of the intestines. Many vitamins have also been identified, such as vitamin D, important for calcium absorption, vitamin B12 for red blood cell formation and preventing anemia, and other functional micronutrients. Greek PDO feta also contains proteins associated with the function of the nervous system and the kidneys, as well as proteins for cholesterol metabolism and blood pressure regulation. The BRFAA’s Proteomics Research Unit has recently developed an innovative methodology that allows for the first time the exact qualitative and quantitative determination of components of liquid or solid food and dietary supplements. Identifying all proteins, peptides, metabolites, lipids and all other groups of molecules of one food creates its “trofometric print,” unique to every food, as is the genetic DNA profile in humans. The specific technology and know-how of the “trofometry” makes the Proteomics Research Unit unique in the Balkans and Southeastern Europe in the application of molecular traceability. In addition to demonstrating the high nutritional value of Greek PDO feta, based on research findings, a new method has been developed for the traceability of the milk used, the determination of fraud, its distinction from similar products and, finally, the identification of the origin of the feta as exclusively a Greek designation of origin. The method can be further applied to all types of food and dietary supplements. The BRFAA’s Proteomics Research Unit has already carried out many nutrition analyses on behalf of the Region of Epirus and the University of Ioannina, highlighting the quality characteristics of economically important animal organisms of the Amvrakikos Gulf, and has also analyzed food from other countries, including Italy and Great Britain. More information is available online: https://www.ncbi.nlm.nih.gov/pubmed/30229078.